I caught up with Lauren last week and talked wedding plans, so I thought it would be a great time to post this session we did back in November. It is hard to remember that lovely weather after the snowstorm that came through today. 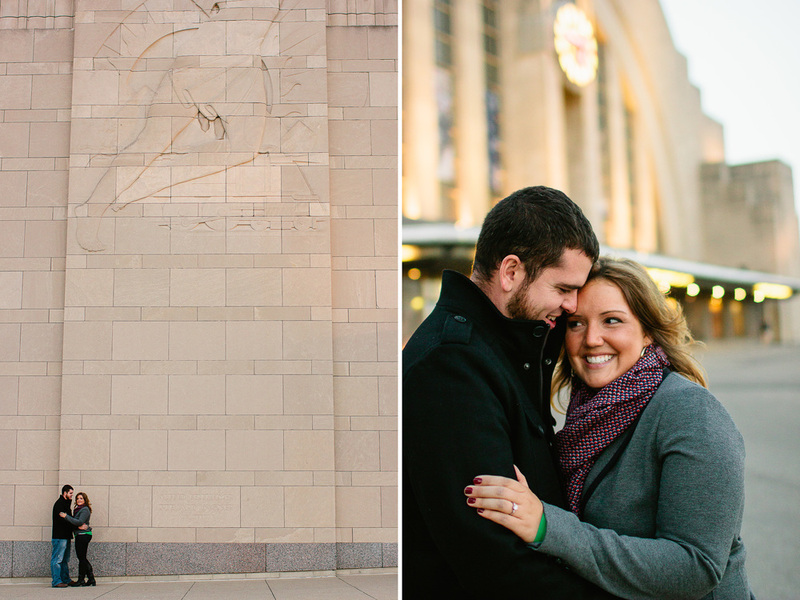 Lauren and Eric both have a love for buildings and wanted to capture that in their engagement photos. I loved their vision and am so excited about how they turned out! As an architecture student, I was thrilled to capture some beautiful spaces around Cincinnati. Their adorable pup also joined us. He looked so regal with his bowtie. Every time I asked Eric and Lauren to kiss, Lauren would try to pull away and laugh. Eric was more than happy to sneak a kiss on the cheek, and those are some of my favorite images. It is obvious that these two are in love and make each other so happy. It makes me smile! Eric and Lauren, you two are so much fun to hang out with. I cannot wait to photograph your beautiful destination wedding in the spring!